In Hinduism, the day begins with Sunrise; an interesting coincidence with this fortnight is that the Sun and the Ascendant are both at the same degree in Aquarius; and the same occurs in the Navamsha chart, albeit in Scorpio. 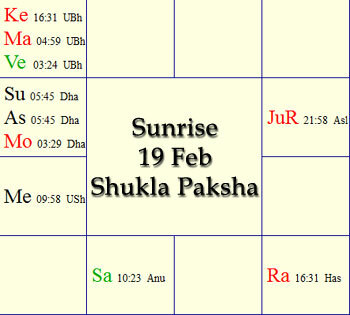 In the sunrise chart, this places the Moon, Sun and Ascendant all in the 4th pada of Dhanishta nakshatra, which is ruled by Mars; Mars is also lord of the 4th pada. This is a dharma nakshatra, and the duty of Mars is to provide protection by way of aspect on 4th and 8th houses so that we may follow dharma and achieve true humanness. This fortnight begins with a focus on two nakshatras, Dhanishta – where the ascendant, Sun and Moon are all in pada (part) 4 of Dhanishta, ruled by Mars. Dhanishta is general purpose good nakshatra for good works. This nakshatra is good for religious activity being of a sustaining nature. In the next sign, Venus, Mars and Ketu are all placed in Uttara Bhadrapada, which is lorded over by Saturn. This nakshatra is fixed in nature, and is also of sustaining purpose. It is reckoned good for meditation, solitude, research and yogic pursuits. Jupiter is the only planet outside the Rahu-Ketu Axis, and delivers glances to Saturn (trine), Mercury (opposition) and to the occupants of Pisces, Venus (exalted), Mars and Ketu. If it were Saturn aspecting Venus, Mars and Ketu it would be a form of Sadhu yoga, a recipe for renunciation of the world. Many predict calamity and disaster when Saturn is in Scorpio, where it is disposited by a bitter enemy, Mars. Saturn and Mars were recently in exchange of lordship, but this has come to an end with the entry of Mars into Pisces. As we shared earlier, there is fire in water as the vedic teachings about the five elements do tell us. Mars is in a water sign (Pisces) with Ketu, who behaves like Mars. While Ketu and Rahu behave in a benefic manner when they occupy signs owned by Jupiter and Mercury, this fire multiplication in a water sign may hint at undersea forms of fire causing disturbances on the surface of our planet in the northerly directions. Saturn aspects Mercury and will continue to aspect Mercury until early in the next fortnight when it moves into Aquarius. We may find ourselves going over ground again, and repeating things in our minds as Mercury continues to recover ground we have already trod in Capricorn. However, Mercury is karaka of intelligence, and Jupiter’s 7th glance from Cancer may give us pause to think about what it is we desire for ourselves and others and exactly what our minds are flitting to and from, and to take this time of retracing thoughts and steps more carefully. Certainly the slow one, Saturn, will provide every opportunity to reflect with interruptions and delays. On Thursday, 19th, Saturn will be in degree aspect to Mercury, beware of impulsive buying of things in order to feel good. While Mercury receives the 7th aspect of Jupiter, it also receives the 5th aspect of Rahu. Rahu is responsible for bring the sins of the past into our lives: with Rahu, we say, present confronts past. Rahu also opposes the gifts of Jupiter, so Mercury retracing steps in Capricorn deserves even more careful reflection. Krishna tells that the mind accompanies the soul from one body to the next; the mind is a bundle of thoughts, a bundle of habits, desires and reactions. When we look at our present preoccupations and ways of dealing with the world, it is Rahu’s task to put in front of us accustomed responses to maya, illusion. What is it we are really doing? Do we ever take a good long look at our responses, our actions, our reactions? It is taught in the vedas iti dristhi iti – the seen reflects the seer. The world reflects what is within. Well, what is it we are perceiving – interpreting, even, – and how are we responding to this? Do we choose our responses based on discrimination and detachment, or is the ahamkara, the “I, Me, Mine” doing boundary protection and defences of inner property? This might just be a fortnight of opportunity for deep inner evaluation and self-audit where Mercury and Rahu are concerned. And when Venus transits between Mars and Ketu there is that potential for stress and distress – with attendant emotional reaction – We could end up doing ourselves a big favour if we were to engage in deep, self inquiry for the next fortnight given the chaotic nodes we are all being confronted with. 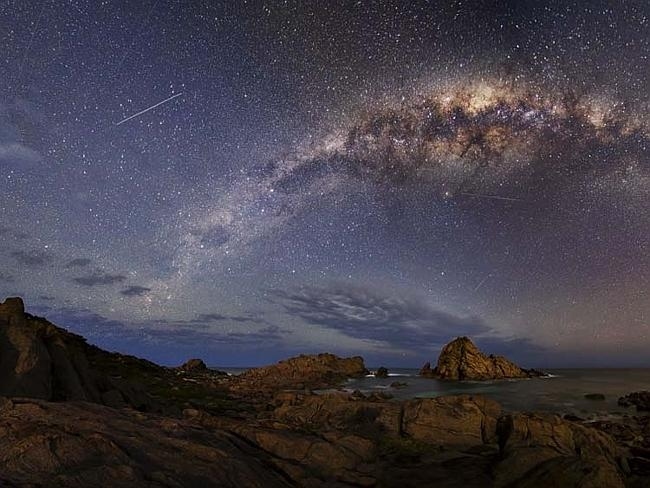 The new Moon begins this fortnight depleted – combust the Sun. Combust planets expose our minds and our attachments in the affairs of the sign where combustion happens. At this time, the Moon is in an air (vata) sign disposed by vata planet Saturn. We may expect sudden inadvertent revelations of what the mind is attached to. We may have attachments to moods, preferred attitudes, feelings and beliefs. The moon is at its weakest when it is conjunct the Sun, and gains strength when it is 60 degrees away from the Sun -in this case – when it enters Aries on 23 February after conjunctions with Venus, Mars and Ketu. There may be an inflammatory – possibly regretful – moment in time when Moon passes between Venus and Mars on Saturday, 21 February. When the blood boils, we lose the energy gained by three months sadhana. Take care that you do not boil during this short and fast transit. We begin the fortnight with Venus exalted in Pisces. Venus and Mars are neutral one to the other, and Venus is friendly with Ketu. Venus begins with near-degree conjunction with Mars, something that quickly becomes a planetary war situation shortly after Sunrise. Venus, being the faster moving planet, will remain in a state of planetary war for nearly 30 hours. While Mars and Venus are neutral one to the other, Mars is pitta in nature, Venus is kapha (fluid) in nature and so there may be quick, hot, short tears for a time. Venus will thereafter be hemmed in between Mars and Ketu for nearly one week. As these two planets have co-lordship of Scorpio, and Ketu (although retrograde) is the stronger, this may be a time of unpleasant hunches being brought to light (particularly in relationships and settings where feelings get in the way) and this may be a good time to take the calming energies of Pisces to hand and examine matters reflectively. In this manner, we may build up our character bank instead of showing one and all how quickly we can get upset.